Do you feel you have much more to offer than the bounds of your current job afford you? At the recent Agile Testing Days conference in Potsdam, one of the most common themes I heard from individuals was just this. That they could be doing so much more for themselves, their teams and their organisations than their given role, remit and management expectations allowed. And that they could be having much more fun in work, too, if only they didn’t feel so pigeon-holed and constrained by their nominal specialism. We’re rarely aware of our prevailing memes and memeplexes which, nevertheless, profoundly influence the way we live and work. My recent post on Theories of Motivation and the Theory X and Theory Y memes is but one case in point. Another of the many memes which pass uncommented and unexamined in most organisations is the idea of specialisation. In the Analytic memeplex, narrow specialism is deemed a helpful and beneficial strategy for making individuals more efficient and productive. This stems back to at least the days of Adam Smith and his 1776 book “The Wealth of Nations” wherein he described the principles of specialisation and division of labour. Subdivide a job – such as making pins – into its constituent operations, and have different workers become expert in each of these different, repetitive operations. This allows for rapid training of non-skilled labour, and “an enormous increase in the productive powers of labour”. In e.g. Lean Manufacturing, companies try to develop workers with multiple skills, multiple specialisms. This aids flow of work through the factory, by allowing workers to redeploy to different jobs and stations when bottlenecks and other impediments to flow arise. The production line can more easily adapt to the ebb and flow of demand. In knowledge work too, we see organisations looking for T-shaped people – people with deep skills in maybe one or two areas, but with useful skills in perhaps a dozen other areas, too. And not only do they look for these T-shaped people, but organise the work such that people can become more T-shaped over time, and get to regularly use their whole range of skills “on the job”. Why this tie to the Specialism meme? Because it’s bound to the other memes of the Analytic memeplex. Try to overthrow or replace this meme, and the other memes in the Analytic memeplex act to oppose the attempt. It seems to me fruitless to address the dysfunctions inherent in the idea of specialisation, without addressing the other, interlocking and reinforcing memes in the Analytic memeplex too. And then we’re into the territory of Organisational Transition and the wholesale, organisation-wide replacement of one memeplex (i.e. Analytic) with another (i.e. Synergistic). How would you explain the continuing hegemony of the Specialism meme in knowledge work organisations everywhere? And what would you suggest by way of means for replacing it? Since its inception, some four years ago, the title for this blog has been “Think Different”. I chose it as a tribute to Steve Jobs, as a reminder of the fundamental role of mindset in creating effective organisations, and as a statement of intent. For me, the ability to think different(ly) has always been the gateway to change, to improvement, to effectiveness, to reducing the egregious waste of human potential we see in so many of our organisations, and to acting differently. But the two interplay. Action influences thinking at least as much as thinking influences action. Research has shown that acting differently – “fake it ‘till you make it” etc. – can indeed help people into thinking differently. The Shewhart Cycle (Plan-Do-Check-Act) shows the circular nature of improvement, and the interplay between thinking and doing. And similar themes underpin Boyd’s OODA loop (Observe-Orient-Decicde-Act) and Allen Wards’s LAMDA loop (Look-Ask-Model-Discuss-Act). Not to mention the Scientific Method more generally. We don’t have to effect a change in our actions all at once. Raymond Aaron suggests that If you have an idea for a new way to act, do it now. Yes, I know, that can sound daunting. But he points out that you don’t have to do it 100% now. Even 1% now is a start. And making a start is a key aspect of acting different. It’s what differentiates acting different from thinking different. Another way to begin acting different is explained by the idea of positive deviance. Go look for positive deviants, and start practising what they’ve already been doing. “It is easier to act your way into a new way of thinking than think your way into a new way of acting”. Think Different by all means, but look for action on acting different, too. For those who have not already come across these terms, Theory X and Theory Y are theories of human motivation, explained by Douglas McGregor in his 1960 book “The Human Side of Enterprise”. These two theories describe two contrasting models – or sets of assumptions – about workforce motivation. In Theory X, management assumes people are inherently lazy and dislike work. As a result of this, management believes that people need to be closely supervised and comprehensive systems of control developed. According to this theory, people will be disinclined to apply effort without extrinsic motivations (bonuses and the like) and will avoid responsibility whenever they can. Theory X managers often rely on the threat of punishment to gain compliance. A Theory X manager believes that his or her people do not really want to work, that they would rather avoid responsibility and that it is the manager’s job to structure the work and energize their people. Under Theory Y, management assumes people may be ambitious, self-motivated and capable of exercising self-organisation. A Theory Y manager believes that, given the right conditions, most people want to do well at work. They believe that people find intrinsic motivation in the satisfaction of doing a good job. Aside: Many people interpret Theory Y as a positive set of beliefs about people. A close reading of The Human Side of Enterprise reveals that McGregor simply argues for managers to be open to a more positive view of people, and to the possibilities that this perspective creates. See also: The Pygmalion Effect and the Golem Effect. For McGregor, Theory X and Y are not different extremes of the same spectrum, but rather two different, orthogonal dimensions. Theory X – and it’s counter part, Theory Y – are two of the key memes in the memeplexes of the Marshall Model. 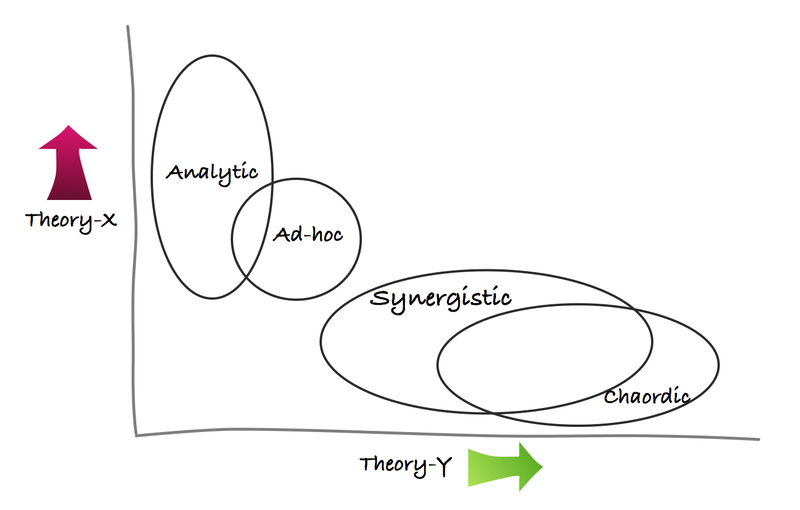 Analytic-minded organisations tend to be archetypes of Theory X, whereas synergistic-minded organisations tend to eschew Theory X in favour of Theory Y assumptions and beliefs. The following chart illustrates the distribution of Theory X and Theory Y over the four mindsets of the Marshall Model. My recent post on No Testing met my needs in that it helped start, and sustain, some interesting face to face conversations at Agile Testing Days 2014 in Potsdam, last week. Of course, face to face, one can explore a subject and clarify confusions rather more easily than via online channels. So, for clarity, my original post suggests that, yes, we don’t necessarily need testing. Not that testing could be done by others, such as developers. Or at other times, such as before code is written, or even as it is being written. Rather, I suggest that folks’ needs can – in some cases – be met by e.g. more capable developers, more humane relationships, an Agile Path to Quality, and letting the team make the difference. I guess this position is a little closer no “No testing” than some have guessed. What Happens To The Testers? Listening at Agile Testing Days, I heard a lot of folks – the majority, testers – expressing frustration, disappointment, etc. about their situations. Specifically, how they felt they could be contributing so much more to their teams and products, if only the opportunity was there. It strikes me that there are so many “testers” willing and able to do so much more than just “testing”, yet find themselves pigeon-holed into a narrow definition of their role. A number of the conference presentations spoke to this theme, including my own and that of Antony Marcano (links to videos soon). addressing the core purpose of their organisations, teams and products. How often do you feel people are listening to you? That they’re interested in how you’re feeling and what you have to say? That by listening they’re connecting with you as a person? How often do you listen well enough that others feel that same way about you? Whilst in Berlin last week for Agile Testing Days 2014, I chose to avail myself of the opportunity to practise my listening skills. In the course of this practise, I’ve learned a few things – and had a mini-epiphany – which I thought might be useful to share with y’all. I’ve written previously about judgment and its connection with the quality of relationships. I’ve been practising for a year or two now on reducing the (moralistic) judgments integral to my observations. This has brought me to the point where I’m now aware of the judgments I’m making – and have been making all my life – whilst listening to things people are saying. You know the kind of thing. Someone says something and you immediately start evaluating what they’ve said, and, incidentally, the speaker themselves: “That’s cool”. “That’s dubious”. “That makes no sense to me”. “They must be mad/bad/stupid/awesome”. And so on. A whole host of judgments. 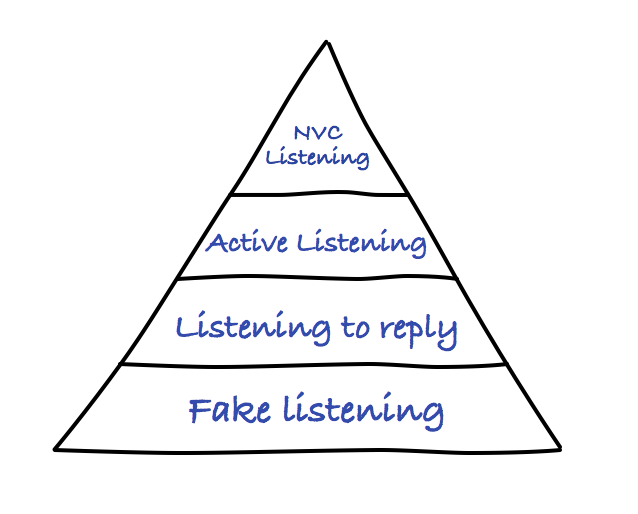 Various researchers have written about hierarchies of listening skills. The hierarchy I have in mind does not correspond closely to the core themes of these other hierarchies. Rather, I’m looking here at the question of listening from the perspective of improving the quality of interpersonal relationships. Listening effectively can help raise the quality of interpersonal relationships, whilst listening ineffectively can actually undermine those relationships. Fake Listening describes situations where the “listener” is only pretending to listen. The sounds of the speakers words are heard, but the “listener” does not process those sounds to derive meaning. Fake listening can be accompanied with some or all the signs of active listening, but the speaker, sooner or later, notices that the “listener” is only faking it. Maybe the most common kind of listening in our organisations, workplaces and working relationships today. Here, people listen just enough to detect when it’s their turn to say something, and to be able to say something seemingly relevant to the thread of conversation. Nancy Kline in her work with the Thinking Environment contrasts this with “listening to ignite thinking [together]”. “To be an effective Thinking Partner is to proffer alert, present, non-judgmental and attentive silence to another while they are thinking. The person being listened to, the Thinker, is held in a benevolent field of attention, free of competition, in which the quality of the listening, is a ‘listening to ignite thinking’ not a ‘listening to reply'”. Active Listening involves listening with all senses. As well as giving full attention to the speaker, it is important that the ‘active listener’ is also ‘seen’ to be listening – otherwise the speaker may conclude that what they are talking about is uninteresting to the listener. 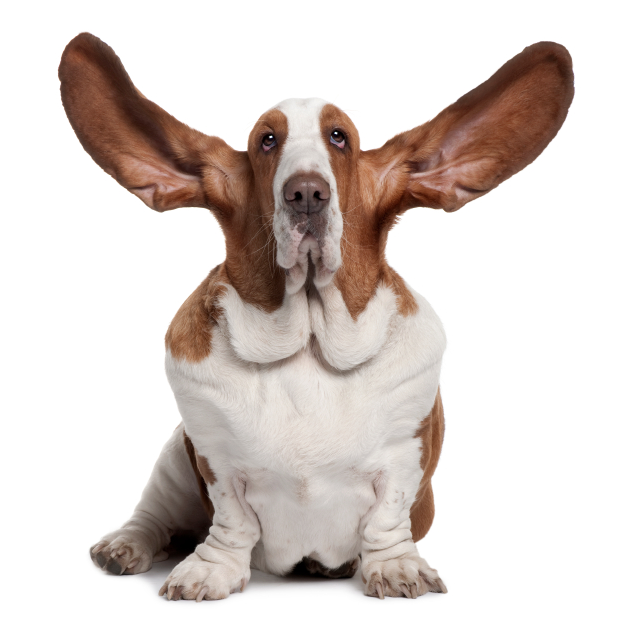 Active listening not only means focusing fully on the speaker but also actively showing verbal and non-verbal signs of listening. Generally speakers appreciate listeners demonstrating their ‘active listening’ by the listener responding both verbally and non-verbally to what they are saying. I’m calling this state of listening “NVC listening” because it draws on the Nonviolent Communication work of Marshall Rosenberg. Specifically, Rosenberg invites us to “empty our mind and listen with our whole being” whilst “focussing on what’s alive, right now, in the other person”. Other have described similar states and labelled them with terms such as “Therapeutic Listening” or “Empathetic Listening”. I choose not to use these terms, primarily because I use what I’m here referring to as “NVC Listening” as a practise technique for raising my awareness of my own judgmental listening, whilst actually trying to “empathise with what is alive in the person” to whom I am listening. [the perception of] the internal frame of reference of another with accuracy and with the emotional components and meanings which pertain thereto as if one were the person, but without ever losing the “as if” condition (Rogers, 1959, p. 210-211). There are many places on the web which explain Active Listening, its benefits, and how to practice it. But the outward signs of Active Listening can often belie our inner judgmental filters through which the speaker’s words are passing. Compassionate listening, in contrast, need not have any outward signs. Although that might be disconcerting or unhelpful for the person speaking. In practising NVC Listening, I try to combine the visible signs of Active Listening with internal aspects of compassionate (empathetic) listening. I try to notice myself whenever I’m beginning to start an evaluation or form a judgment, and short-circuit // override that in favour of getting in touch with what’s alive in that person. We can notice our natural tendency to judgmental listening if we have something else to focus on. In NVC Listening I focus on what might be alive in the other person. Where they’re coming from. What’s important to them. Their possible feeling and needs underlying the things they’re saying. I believe that we can improve our listening skills, and that skilful listening can have a deep impact on the quality of our relationships – relationships essential to working effectively with each other in knowledge-work settings. Positive Psychology studies have revealed the positive effects on happiness, life satisfaction, energy, etc., that come from appreciation. Nonviolent Communication suggests we look for what’s alive in people. Whenever I’m practising NVC Listening, I’m not only also trying to sense what’s alive in the person to whom I’m listening, but also I’m trying to appreciate that aliveness. To value it. To savour it. To give thanks for it. When it’s working for me, this appreciation gives me the energy I need to continue. All of the above not only applies when we’re listening to other people, of course. It applies at least as much when we’re listening to ourself. To our own thoughts, feelings and needs. And the irony of writing about listening – absent any immediate opportunity to listen to the thought and reactions of the reader, and connect with them as people – is not lost on me. I invite you to have a go at “NVC Listening” when you find yourself with a suitable opportunity. I’d be delighted to hear how it seems to affect the quality of the relationship with the person – maybe even yourself – to whom you are listening. It’s Not Enough To Listen ~ Jessica Grogan, Ph.D. Testing. Checking. Inspection. Exploration. Learning. Everybody has a different understanding of what testing is. And is not. (Hint: AFAIC, it’s NOT “QA”. And it’s NOT “TDD”). I’m not going to upset people by offering my own definition. I make no claims to be an expert on testing. When I’m a customer, I know I don’t want to pay extra just for a product that works as advertised. By extension, I’d not want to pay for testing. I want a product that “just works”. And if asked to pay more, I’d have to enquire skeptically “why can’t you people build it right in the first place?”. Some years ago now, David Anderson wrote a blog post asserting that “All testing is waste”. I concur. But is it necessary or unnecessary waste (Type I or Type 2 Muda?). And does that categorisation depend on the capabilities of the team(s) – the developers – building the software? If the developers can’t deliver software with the intended levels of defects (which could be non-zero, btw) then maybe testing is a necessary waste, to compensate for that inability. And maybe it’s cheaper and more humane to employ less capable developers, bolstered by testers, than to have capable developers who can meet intended defect levels reliably. So, do we have to test, despite the customer being unkeen to pay for it? Despite it adding little or no value from the customer’s point of view? Or can we find other, more economic and humane ways to meet the needs testing currently addresses? “Testing” is one strategy for getting folks’ needs met. Some of their needs, at least. We might imagine there could be other strategies for getting those same needs met. What needs does testing address? And who has these needs? Testers need to continue earning a living in their chosen profession, to feel belonging in a community, to earn the respect of their peers for a job well done, to continue their self-development and learning, to add value and make a difference. Customers need stuff that works (that meets their needs), for a price they’re willing to pay. Companies making stuff need to safeguard their reputations and revenues. Managers generally need to appear capable of delivering new products which meet the company’s and customers’ needs, whilst also controlling margins (costs vs returns). And of course every individual may have their own particular personal needs, too. My question is: “Is testing the best strategy for meeting all the above needs?”. It may be the best known. The most widespread. The default. But is it the most economic? The most humane? Indeed, what are the dimensions of “best” here? Or even of “reasonably effective”? “No Testing” attempts to flag up these questions. No soapbox. Just open enquiry. Caution! Raw emotions, vulnerability and plain-talking on display. For many years now, every day starts with me asking myself “Is today the day I’m going to kill myself?” It hasn’t happened yet. So I wonder will there ever be a day when it does happen? And yet, the little voice still asks the daily question. Where does the voice come from? Damned if I know. I don’t believe I’m suffering from depression. Or bipolar. Although given the state of mental healthcare provision in these parts, I’m unlike to find any help in resolving that question. Even if I felt like following that path. I can’t for the life of me (sic) understand why the unmet-ness of these needs makes me wonder about something as final as suicide. In the cold light of day, they hardly seem to possess the giant import my subconscious confers on them. Most days, life just seems so damn pointless. And little to zero prospect of any future day being any different. It’s that tiny possibly, though, along with the love and concern I have for my family and friends, that keeps me from pulling the metaphorical trigger. I do appreciate those folks who let me know that I’m making some kind of difference in their lives. But it does little to dispel the feeling of futility. I have no clear aim in mind. But maybe there are some other folks out there with similar thoughts and feelings. Perhaps it’s an attempt to empathise. A different path to meaningful (human) connection? Or maybe just putting these words down can shine a light on the matter, for my own reflection. Will I publish this? I generally publish most of my ramblings. So I guess this one will get published too. Thoughts of consequences swim in and out of consideration. But who can tell where disclosure will lead? Or non-disclosure? Surely any shift has to be for the better? I’m thinking there’s likely no simple solution, no one thing that will get my needs met. No one thing to quieten that insistent little voice. But just presently, I’m guessing that some gainful employment might help. Some role that involves working and making meaningful connections with folks that are looking to make a difference too. Would you be willing to consider if you might know of, and be able to put me in touch with, someone like that? You may be inclined to respond. That would be fine. Although I’m not looking for sympathy. Or advice. In any case, thank you for reading this far. I anticipate some judgmentalism, too. We’re only human, after all.